As we know that Chinese New Year is going to celebrate after 6 days from now. So in this auspicious occasion, WonderFox comes up again with the collaboration of Aoao Digital Studio a brand new freebie. In this occasion Wonderfox is providing its precious software which is known as HD Video Converter Factory Pro and Aoao Digital Studio is providing its primer software called as Aoao Video to GIF Converter and you guys can get these 2 valuable software totally free. Yes don’t get shock, these software’s are available totally free. This giveaway promotion will last till March 1st, 2015. HD Video Converter Factory Pro, developed by WonderFox Soft, provide powerful video editing function and video effect. It’s a real all-in-one video converting tool. The professional HD Video Converter with powerful functions could meet high requirements for users. This cheapest professional HD video editing software offers much better video/audio quality. It owns friendly and simple interface, and very easy to control all the functions, fast converting speed could save you a lot of time. The HD Video Converter Factory Pro has set the common resolution for portable devices, and you can also change the resolutions and sizes for your own PSP or iPhone, iPad, etc. Besides, all operations are simple to control. It also supports converting all the High Definition and HD-Camcorder videos, to both portable and console players, such as iPad, iPod, iPhone, Apple TV, PS3, PSP, Xbox, Zune, PDA, BlackBerry, Nokia, Android, Zen, etc,. Supporting Multi-CPU and Hyper Threading, HD Video Converter Factory Pro offers up to 3x – 5x real time video converting speed. 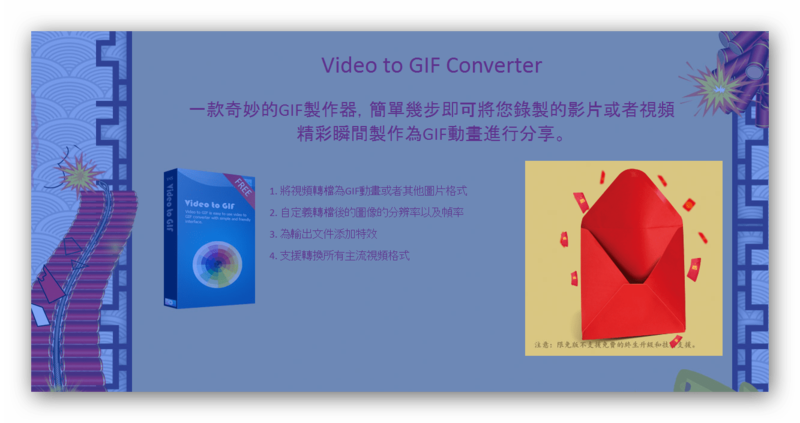 Aoao Video to GIF Converter, developed by Aoao Digital Studio, is a simple and quickvideo to GIF software on Windows, capable of converting all popular formats of video to animated GIF, let you play video in GIF image. Support import video formats includes AVI, MPEG, MP4, MKV, WMV, MOV, 3GP, etc. Aoao Video to GIF Converter allows you to select any period of time you want to convert. Besides, Rate Setting function means you can set 24 frames per second or just 1 frame per second to get animated GIF with small size. It also adopts time slider + frame rate control to set part of outputting. On this basis, you can also fine-tune to each frame (usually one minute with 24 frames). Aoao Video to GIF Converter is able to add varieties of special effects to retouch your GIF during conversion process and it will just need one click and no extended time. You guys have to visit WonderFox Chinese New Year 2015 Giveaway Landing Page which is in Chinese language but you don’t need to get worry about it because you guys just need to click on the two red envelopes (images included above) given under each software’s to download the zip file of the giveaway packages. License code is given on the license.txt file. Giveaway software does not support upgrade. Hope things work out as planned………!! Thanks for providing the info. I am in it. Thank you for the information. I am able to collect the wonderful freebie. I grabbed the freebie. Thank you so much for the information.